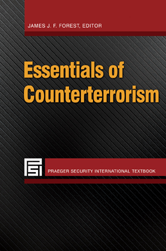 Editor: Forest, James J. F.
This compendium offers a wide-ranging look at the most vital aspects of counterterrorism, from diplomacy and military action to the investigation and interdiction of terrorist finances. Entries offer insightful discussions of strategy, policy, tactical, and operational dimensions of counterterrorism. Chapter Six The Shadow Economy: The Forgotten Infrastructure of Terrorist Financing - Joseph J. St. Marie, Shahdad Naghshpour, and Samuel S. Stanton Jr.